Falls Village Skilled Nursing & Rehabilitation provides quality nursing care and medical treatment within a caring and compassionate environment. For residents requiring long-term care or recovering from surgery injury or illness, our facility offers spacious private rooms, comfortable lounges, inviting dining areas, landscaped courtyards and lively activity spaces that provide therapeutic benefits and promote wellness. Falls Village is Medicare & Medicaid certified. In addition, we accept most managed care and commercial insurance, as well as private payment. Falls Village’s diagnostic, therapeutic and personal services play a significant role in making us a comprehensive care facility. These services are provided on-site to afford our residents comfort, convenience and faster response times. 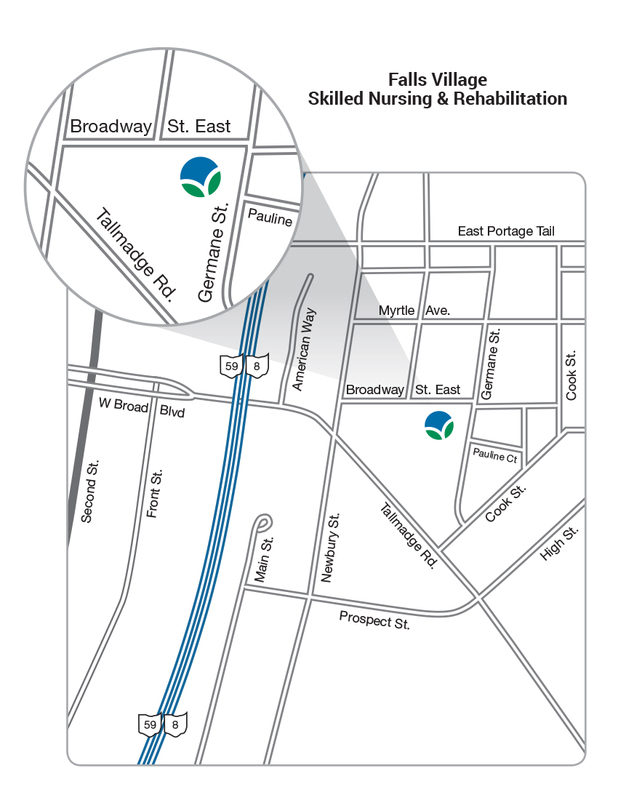 Falls Village is conveniently located off State Routes 8 and 59 in Cuyahoga Falls, we are easily accessible from all Akron area hospitals. We believe our most important partnership is the one we establish with our residents and their families and loved ones. Our interdisciplinary approach to care requires a coordinated team of in-house professionals from various disciplines, as well as partnerships outside of Falls Village. 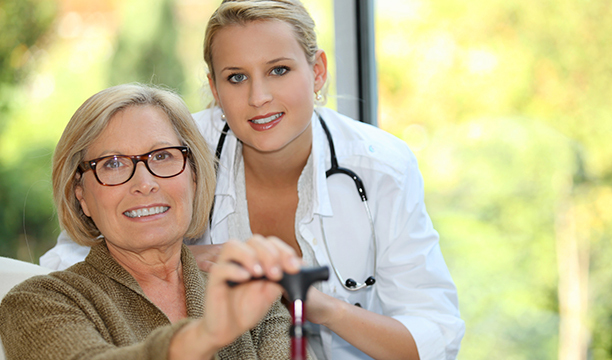 Encore Rehabilitation Services is a provider of customized rehabilitation services to skilled nursing facilities throughout NE Ohio. Services include physical, occupational and speech therapy. Cece was diagnosed with Pneumonia this winter. 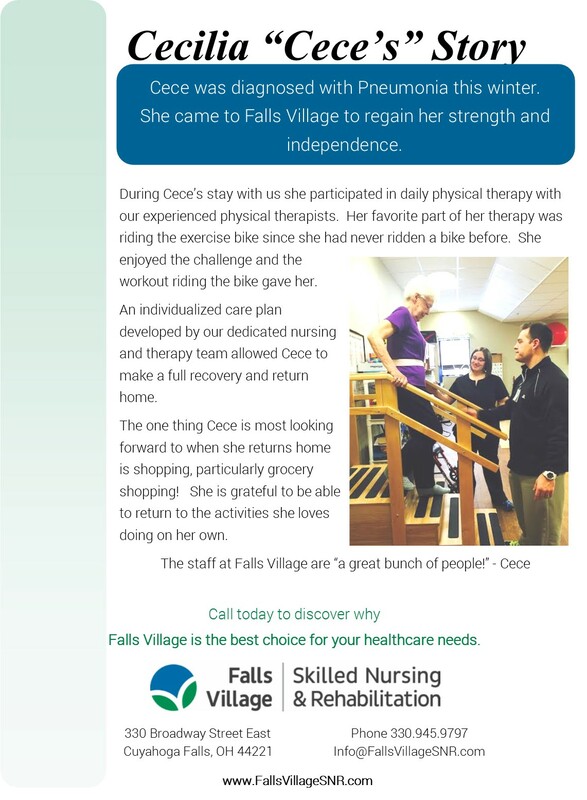 She came to Falls Village to regain her strength and independence. During Cece’s stay with us she participated in daily physical therapy with our experienced physical therapists. Her favorite part of her therapy was riding the exercise bike since she had never ridden a bike before. She enjoyed the challenge and the workout riding the bike gave her. An individualized care plan developed by our dedicated nursing and therapy team allowed Cece to make a full recovery and return home. The one thing Cece is most looking forward to when she returns home is shopping, particularly grocery shopping! She is grateful to be able to return to the activities she loves doing on her own.